Travel Specialist Group understands that not every bride dreams of a hometown wedding. Instead some couples dream of ceremonies in romantic locations like Greece or Italy or exotic destinations like Tahiti or Jamaica. The best part? 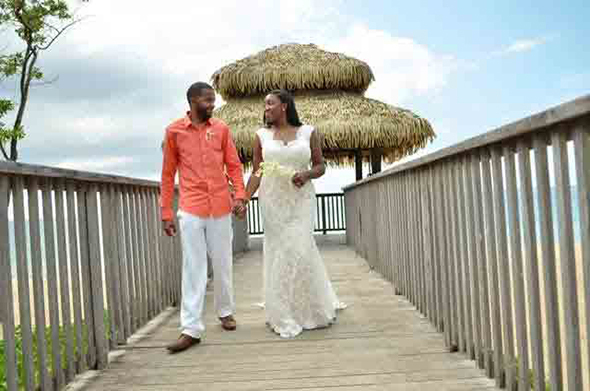 Destination weddings are usually less expensive than traditional weddings. Not sure if a destination wedding is right for you? Contact us today. “Overall our trip to Jamaica and the resort was AMAZING. It was everything I thought it would be. This trip was our first time flying with Delta airlines so I was pleased with the customer service. This was reassuring considering I was flying with my wedding dress. I experienced no issues at all making sure my dress was stored properly while traveling. Thanks to your keen attention to detail,I had all of our travel documents ready in hand for customs purposes and the resort staff. This made the check-in process flow smoother than what most other guests were dealing with. Once we reached MBJ we were greeted with a friendly bag carrier and drinks in the waiting area while the travel van was prepared.Very nice accommodation! Although the ride to the resort as lengthy as I was informed,the ride wasn’t bad at all.We enjoyed looking at the scenery. My only complaint is that I was not pleased with how long it took them to prepare our room at Sandals Whitehouse once we arrived.After traveling all morning we were tired and ready to get settled in. I estimated it took 45mins. to an hour for them to get our room ready. I had to check with the front desk staff twice before we were taken to our room. Once we were settled into our room it was smooth sailing from that point forward! Our room was cleaned while we were out for the day and the bed was turned down daily for the night.The food was excellent,the drinks were great and endless,and there was always something to do when time wasn’t spent relaxing by the pool or on the beach. We enjoyed some of the shows and even just sitting by the firepit. It was all great! the candlelight dinner was insanely perfect!! Our server was so nice and the set up was right at sun down was like something out of a movie! !Pure romance! Most definitely one of our top moments of the trip. The wedding consultants we met with before our ceremony were great and covered every detail. Our ceremony was perfect…everything I imagined. It was personal, it was beautiful, it was exactly what I wanted for our big moment. No other way to describe it. Contact us to plan your dream wedding today!